This fall, the Wisconsin Institute for Discovery is taking steps to leverage its expertise in interdisciplinary research to serve the University of Wisconsin­–Madison campus in innovative ways. Each hub is made up of scientists and staff able to connect researchers inside and outside of WID with access to expertise or services to advance their projects. For example, a researcher interested in incorporating microbiome research into a project, but who lacks expertise in experimental design or data analysis in the field, could engage with the hubs to find guidance, collaborators, training, and tools to assist them in their new research direction. 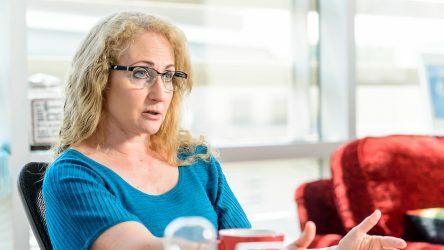 “The hubs were created in consultation with researchers from dozens of UW–Madison departments to build and develop new interdisciplinary fields and to facilitate stronger connections between disparate fields,” explains WID Director Jo Handelsman. 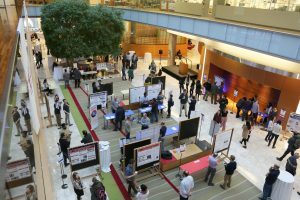 Stations were staffed by researchers and support personnel from each of hubs and included project-focused posters that showcase projects and collaborations made possible by the hubs, interactive exhibits centered around science communication, guided conversations about specialized trainings, and more. Each hub was designed to meet different needs of researchers across campus. The Data Science Hub grew in response to the highly decentralized data-science environment at UW–Madison. After a series of town hall-style meetings, hub co-leaders Michael Ferris, Professor of Computer Sciences, and Brian Yandell, Professor of Horticulture and Statistics, designed the new hub to help researchers better design and execute data-rich research projects. The hub’s staff can link researchers to data and computing resources on campus, make connections to start new collaborations, and provide or build training sessions in data and computing skills. The Multi-Omics Hubs are focused on building capacity for researchers studying large biological datasets known as “-omics”, such as genomics and metabolomics, which have revolutionized biological research. The Multi-Omics Hubs launch with two specializations, a Microbiome Hub and an Epigenetics Hub. The Microbiome Hub offers consulting services, connects researchers, and organizes campus-wide efforts around microbial communities, while the Epigenetics Hub provides resources for studies of heritable traits that extend beyond DNA sequences alone. The hub’s leader, Professor of Biomolecular Chemistry John Denu, expects that “-omics” efforts on campus, aided by the hubs at WID, will expand in size and scope in the coming years. The Illuminating Discovery Hub will create connections among scientists, professional communicators, and members of the public to increase understanding of and support for the scientific enterprise. 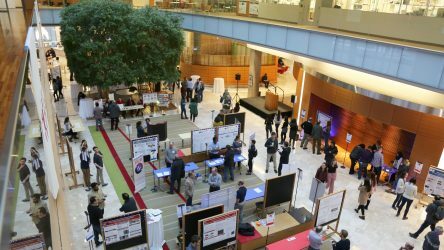 The hub is a partnership between WID, the Wisconsin Alumni Research Foundation and the Morgridge Institute for Research, as well as other campus and national organizations. The Illuminating Discovery Hub offers training programs for science communication, creates opportunities for public engagement with science and scientists, and facilitates discussions about the role of science and technology in society. Together, the hubs represent a new path forward for collaborative research projects and fields. “By better connecting researchers with resources, trainings, services, outreach opportunities, and one another, the hubs are building critical infrastructure for the future of interdisciplinary science,” says Handelsman. 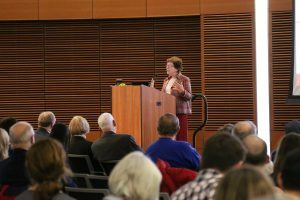 At the event on Wednesday evening, Chancellor Rebecca Blank announced an ambitious new partnership in Wisconsin to create, connect, and activate world-class content creators in science, instruction, and media with teachers and learners across the state and the nation. Sandra and Monroe Trout, who earlier created the Timothy William Trout Education Endowment Fund at Wisconsin Public Television, have made a gift of $2.1 million as an investment in Illuminating Discovery Hub partner WPT recognizing the power of public media to help learners, teachers, and parents with valuable educational programming and resources. 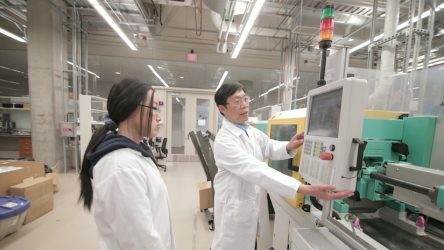 The partnership will join UW–Madison’s premiere science discovery labs through a partnership with Discovery outreach, a joint venture of the Wisconsin Institute for Discovery, the Morgridge Institute for Research, and the Wisconsin Alumni Research Foundation. The UW-Madison School of Education, a leading public school of education in the nation, and WPT’s media resources, broadcast, online, and classroom engagement reach will comprise the Timothy William Trout Education Innovation Lab. 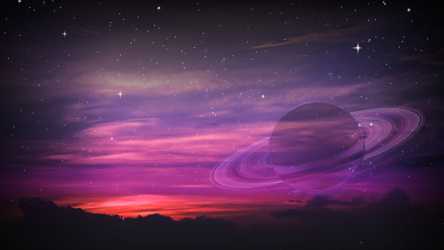 The event also featured an illumination-themed edition of the popular SoundWaves series of paired lectures and music performances with short talks by hub-affiliated scientists and music—Claude DeBussy’s La cathédral engloutie—from UW–Madison scholars Daniel Grabois and Shuk-ki Wong.